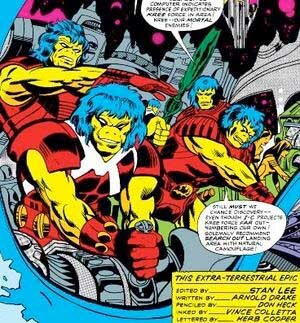 En este número tiene lugar la primera aparición y es creada la raza extraterrestre de los Aakon, según Drake, enemigos mortales de los Kree (aunque poco después Roy Thomas convertiría a los Skrull en los verdaderos “enemigos mortales” de los Kree). Una nave comercial Aakon necesita reparar su nave, y aunque saben que los Kree están cerca no tienen otro remedio que aterrizar en la Luna. 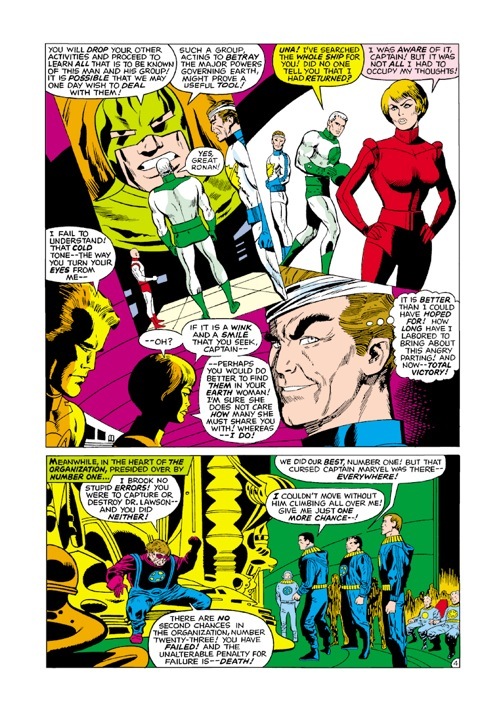 Yon-Rogg, sabiendo que los superan en número les ataca con el resto de soldados Kree, aunque en la batalla sufre heridas y tiene que ser salvado por Mar-Vell quien mata al líder de la nave en su intervención. 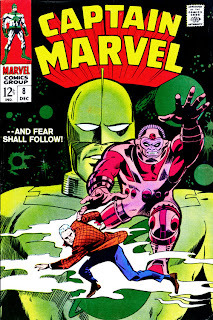 De vuelta a la Tierra, Mar-Vell se dispone a investigar sobre Walter Lawson (quien recordaréis que es el científico muerto al que le robo la identidad para infiltrarse en la base del Cabo de Florida). Llega a su casa (prácticamente una mansión) y descubre un laboratorio secreto con tecnología nunca vista en la Tierra (como el laboratorio de Dexter vamos...) y con el molde para crear un robot enorme. Poco después aparecen unos criminales en busca de Lawson y averiguamos que el científico era financiado por una organización llamada “La organización”, y le habían encargado la creación del robot asesino perfecto. Mar-Vell tendrá un encontronazo con los miembros de la organización que estaban buscando a Lawson, después su líder ordenará la muerte del Capitán Marvel. De vuelta en el Cabo, el Capitán Marvel le cuenta parte de lo que averiguó sobre Lawson a Carol Danvers (y está como siempre se lo agradece de manera efusiva, lo que no hace más que aumentar los celos de Una). 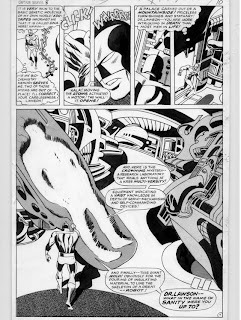 Poco después Mar-Vell descubre que el robot estaba siendo pruebas y su primera misión era matar al propio Lawson, así que poco después el robot encontrará a Mar-Vell como Lawson y atacará el Cabo, por lo que el Capitán Marvel se enfrentará al robot creado por Lawson. 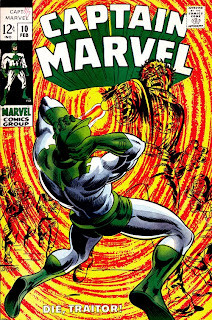 In this issue takes place the first appearance and is created the alien race of the Aakon, according to Drake, mortal enemies of the Kree (although shortly after Roy Thomas would make the Skrull the real "mortal enemies" of the Kree, or at least the most "mortal enemies"). An Aakon commercial ship needs to be repaired, and even they know they are close to a Kree Ship they have no other choice but to land on the moon. Yon-Rogg, knowing that they outnumber them attacks with other soldiers, although during the battle is injured and has to be saved by Mar-Vell who kills the leader of the ship. Back on Earth, Mar-Vell is preparing to investigate Walter Lawson's past (who remember is the dead scientist and Mar-Vell stole his identity to infiltrate in the base of the Cape of Florida). He arrives at his home (practically a mansion) and discovers a secret laboratory with technology never seen on Earth (as Dexter's lab more or less ...) and a mold to create a huge robot. Shortly after criminals are looking for Lawson too. 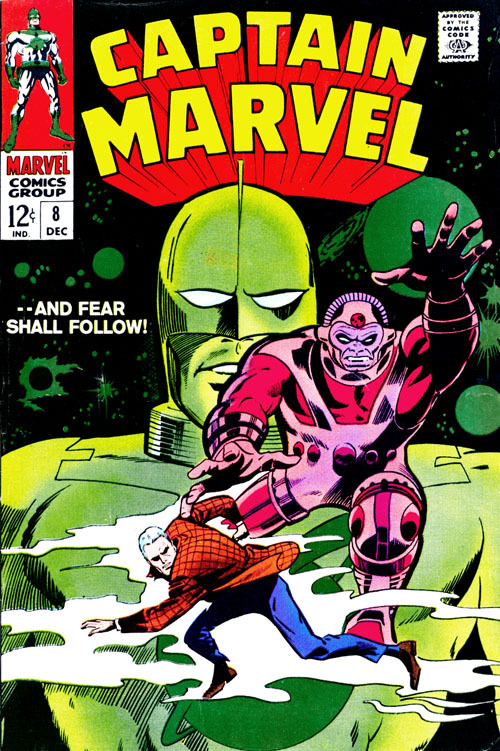 So Mar-Vell finds out that the scientist was funded by an organization called "The organization", and had commissioned the creation of a special robot, the perfect murderer. 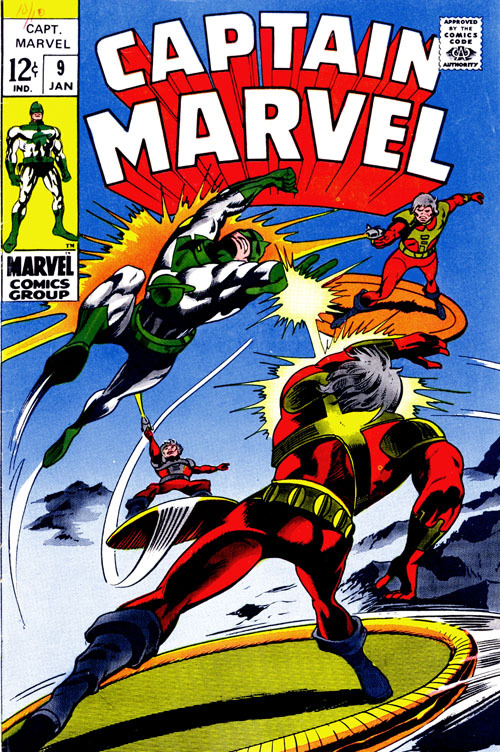 Mar-Vell is attacked by some members of the organization, after that, their leader orders the death of Captain Marvel. 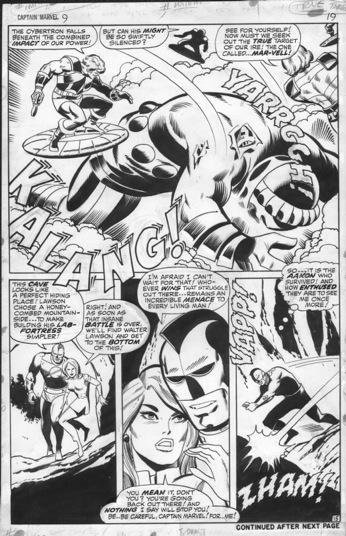 Back at the Cape, Captain Marvel tells a few things of what he has found out about Lawson to Carol Danvers (and she, as everytime, thanks him so effusively, which only makes Una increase her jealousy). 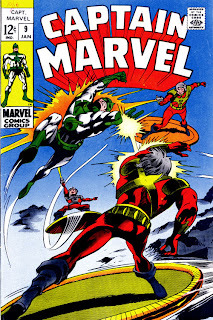 Soon after Mar-Vell discovers that the robot was being tested and its first mission was to kill Lawson himself, so shortly after the robot finds Mar-Vell as Lawson and attacks the Cape, so Captain Marvel will face the robot created by Lawson. 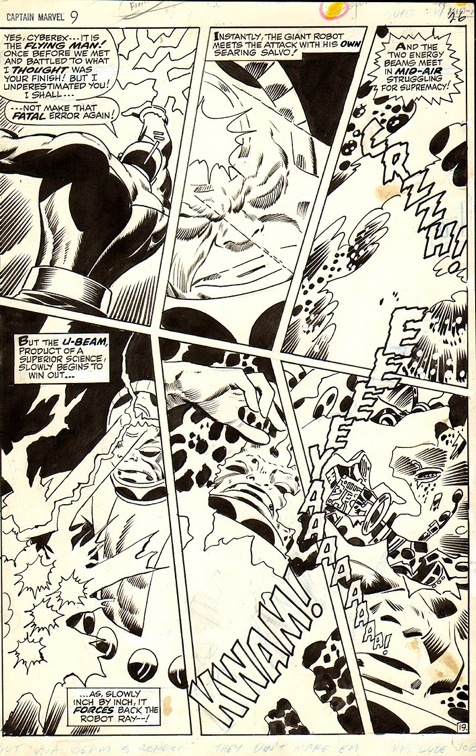 Este número comienza con Mar-Vell siendo atacado por los Aakon que buscan al asesino de su comandante. El Capitán consigue escapar y esconder la presencia de los aliens a ojos terrícolas. En ese momento Carol registra la habitación de Lawson pero es atacada y secuestrada por el Robot de Lawson (se auto-reparó desde que fuera vencido por Marv), Cyberex. 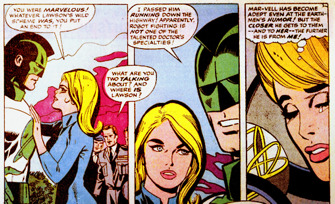 Cuando Mar-Vell descubre lo que le ha pasado a su habitación (quedó destrozada tras el secuestro de Danvers) y la desaparición de Carol se dispone a volver al laboratorio de Lawson y se enfrenta al robot. No consigue vencerlo dentro del laboratorio así que lleva la pelea al exterior donde los Aakon le estaban esperando (Yon-Rogg les había ayudado a localizar a Mar-Vell de manera anónima), aunque los utiliza en su favor para que los Aakon destruyan, aparentemente, al robot, pero poco después vuelven a por el Capitán y le dejan inconsciente. Creen descubrir un código secreto de guerra Kree aunque son sorprendidos al instante por el robot ya auto-reparado quien no tarda mucho en acabar con los Aakon, aunque esta vez Mar-Vell si que consigue acabar con el robot de una vez por todas. 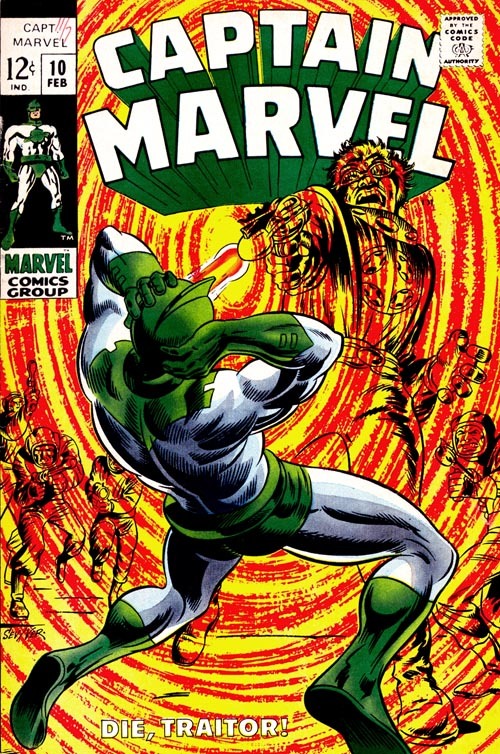 This issue starts with Mar-Vell being attacked by the Aakon, who are seeking the murderer of his commander. The captain manages to escape and hide the presence of aliens to the eyes earthlings. 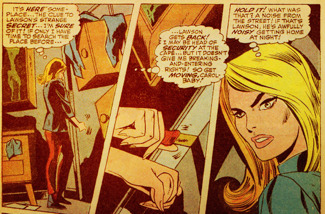 At the time Carol is looking for some clues about Lawson at his hotel room but she is attacked and kidnapped by the Lawson's robot (self-repaired since it was defeated by Marv at the end of the previous issue), Cyberex. When Mar-Vell discover what happened to his room (it was destroyed after the kidnapping of Danvers) and the disappearance of Carol, he returns to Lawson's laboratory and faces the robot. He can't defeat the robot inside the lab so he takes the fight outside where the Aakon were waiting to attack Mar-Vell (Yon-Rogg helped them to locate Mar-Vell anonymously), but uses them in his favor and the robot is destroyed, apparently, but the Aakon soon return to attack the Captain and they apparently defeat heim and leave him unconscious. 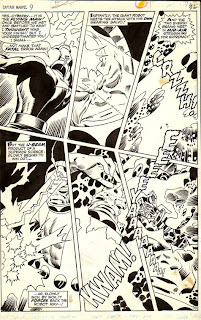 They believe that they have discovered a secret Kree code of war among Mar-Vell's belongins but shortly after they are surprised by the robot, who was instantly self-repaired and who does not take long to end the Aakon, although this time Mar-Vell (who was awake) destroys the robot.